We still do not know if there’s life on Mars or even if there was one day but some hardy microbes could indeed survive on the Red Planet, a new study claims. A new research, led by Rebecca Mickol, found that in the laboratory, some micro-organisms — species of methanogens, among the simplest and oldest Earth’ organisms — withstanded the temperature swings and low pressures conditions that simulated a subsurface liquid aquifer on Mars. These organisms are ideal candidates for life on Mars. All methanogen species displayed survival after exposure to low pressure, indicated by methane production in both original and transfer cultures following each experiment. Methanogens are microscopic creatures which could survive without oxygen (for most of them, it is even fatal), they use hydrogen as their energy source and carbon dioxide as their source in order to metabolize and produce methane ~ hence their name. They can be found in marshes, or under the soil surface but can also be found in the gut of cattle as well as in dead and decaying matter. They don’t require oxygen. They don’t require organic nutrients, either, and are non-photosynthetic, indicating they could exist in sub-surface environments and therefore are ideal candidates for life on Mars. Halophiles and methanogens. © Maryland Astrobiology Consortium, NASA and STScI. 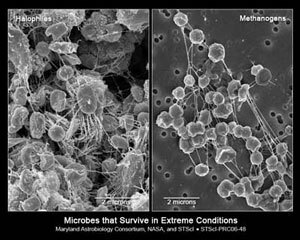 Last year, emerging research suggests that two species of methanogens, Methanothermobacter wolfeii and Methanobacterium formicicum could also thrive and survive on Mars, they actively grew on temperature variations between -90° and +27°. Despite the fact that these organisms prefers middling temperatures, ideally 37° C, while the other likes it hot—55° C, they were able to adapt even as temperatures fell to nearly freezing. The survival of these two methanogen species exposed to long-term freeze/thaw cycles suggests methanogens could potentially inhabit the subsurface of Mars. They could potentially survive on Mars, because there could be small environments somewhere on the planet where these organisms could thrive and grow and begin to populate. That’s why the Planetary Protection Program exists at NASA, so that we make sure we’re not contaminating Mars. If we ever bring back a sample, we don’t want to contaminate Earth, either. This work represents a stepping-stone toward determining if methanogens can exist on Mars.